Delegate: Mr. Man Wook Hoe , Marine Development Division, Ministry of Oceans and Fisheries. The Ministry of Oceans and Fisheries (MOF) established the commercialization plan for ocean energy systems to contribute to the new national renewable policy to provide 20% of electricity from renewable sectors by 2030. To support this Ministry’s plan, many R&D projects are being carried out. 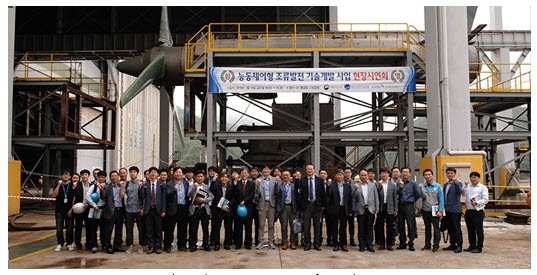 Korea Research Institute of Ships and Ocean Engineering (KRISO) has been investigating small wave energy converters (WECs) of the oscillating water column (OWC) type integrated in breakwaters combined with an energy storage system (ESS) and connected to a micro-grid. The 300kW floating pendulum type WEC was grid-connected in 2018 and will be tested further. A tidal current and pumped hydropower combined energy conversion system has been developed and will be tested in the field in 2019. A 200 kW active-controlled tidal energy converter (TEC) was fabricated and tested onshore in 2018 and will be deployed in 2019. Two open sea test sites for WECs and TECs are also being developed. Korea Wave Energy Test and Evaluation Centre (K-WETEC) managed by KRISO is now in its first phase of development (May 2016 - December 2019), and Korea Tidal Current Energy Centre (KTEC) established by Korea Institute of Ocean Science and Technology (KIOST) is under development (May 2017 – December 2022). A new international cooperation project between Korea and China was initiated to exchange technology development and utilization of ocean energy systems (2018-2020). As part of this project, the first China-Korea Symposium on Marine Energy was held in Zhoushan Campus, Zhejiang University with a technical visit to the test site for TECs on Zhairuoshan Island. Under the new Ministry’s action plan of “2030 Ocean Energy Development Plan” for developing and disseminating the ocean energy systems, a strategic plan was established in the field of tidal and wave energy development. This plan is divided into four steps, including (1) expansion of R&D in ocean energy and establishment of open sea test sites, (2) construction of a large-scale ocean energy farm, (3) entering the global market and expanding domestic supply, and (4) the establishment of the ocean energy certification system and the supporting policy. The steps for commercialization for tidal and wave energy technologies are summarized in the following two figures. Commercialization steps for wave energy technologies (left). Commercialization steps for tidal energy technologies (right). The renewable portfolio standard (RPS) was established in 2012 to enforce utility companies with the capacity of over 500 MW to provide an obligatory portion of the total electricity production with renewable energy based on the governmental policy, “Acts on the Development, Utilization and Supply Promotion of Renewable Energy”. The market incentive plan, known as tradable Renewable Energy Certificate (REC), supplements the RPS policy. The value of REC is currently given as 2.0 for tidal current, 1.0 for tidal barrage with embankment and 2.0 for tidal barrage without embankment, whereas the value of REC for the wave and ocean thermal energy is not to be determined. Recently the value of REC for the offshore wind has been increased from 2.0 to 2.0 – 3.5 according to the distance from coastal line to promote the offshore wind industry. However, the values of RECs for tidal energy were not increased. MOF provides public funding for ocean energy R&D projects including demonstration projects, and USD13.3 million was invested for the development of ocean energy systems in 2018. The annual budget for ocean energy R&D projects is planned to be USD16.2 million in 2019. Two new projects will be initiated to develop (1) 1 MW TEC and (2) TEC for remote islands with ESS will in early 2019. MOF has been supporting two construction projects of the open sea test sites for WECs and TECs. The construction project for WECs started in May 2016 and will be finished in December 2019. The western waters of Jeju Island were selected as the test site, and the existing Yongsoo OWC-tyep WEC is utilized as the first berth for OWC-type WECs and also as the offshore substation for the open sea test site. KRISO has been in charge of developing the project and the total budget is about USD17.3 million. Four more berths, two in shallow water in 15 m water depth and two in deep water in 40-60 m water depth, have been connected to the offshore substation and the grid system with the total capacity of 5 MW. The offshore cables were installed in 2018. The floating pendulum wave energy converter (FPWEC), with the capacity of 300 KW, was connected to the fourth berth with 40 m water depth in 2018. The fifth berth with 60 m water depth is expected to be used for floating offshore wind turbines as well. Open sea test site for wave energy converters (left). Installation of offshore cables nearby the existing OWC WEC (right). The construction project for open sea test site (i.e. Korea Tidal Current Energy Centre, KTEC) with 5 berths of 4.5 MW grid-connected capacity for TECs is being carried out from May 2017 to December 2022 by KIOST. Furthermore, the onshore performance test facilities for components of TECs, such as blade and drive train, will also be constructed in this project. The southwestern waters of the Korean Peninsula are primarily considered as the tidal energy test site, where the Uldolmok tidal current pilot plant (TCPP) is operating nearby. 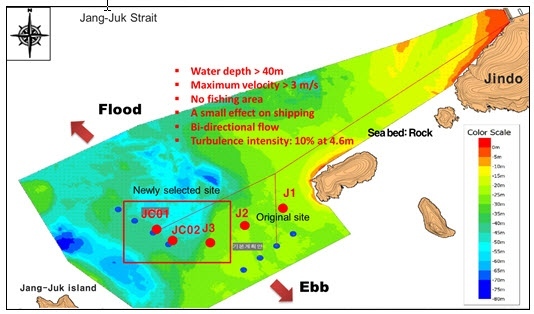 Uldolmok TCPP will be utilized as the test site for small and medium size TECs under 500 kW due to the limited water depth about 25 – 30 m. Several possible arrangements of test berths in JangJook Strait were studied in 2018, and a newly selected arrangement was confirmed to have better condition with sufficient water depth. Since 2012, the development project for the 300 kW floating pendulum-type wave energy converter (FPWEC) has been carried out by KRISO with the support from MOF. The size of FPWEC is 23m(B) x 30.5m(L) x 10m(H), hydrostatic power transmission was used for PTO and connected to 300 kW and 11kV synchronous generator, and 4 point 8 lines catenary system was applied for mooring. The construction of FPWEC was completed in 2016, and the remote operating and monitoring system was tested and optimized in 2017. The FPWEC was installed at the fourth berth of K-WETEC and grid-connected in 2018. Bird eye view of FPWEC (left). FPWEC installed at K-WETEC (right). The project is aimed to develop and demonstrate the active-controlled, high efficiency and low cost 200 kW TEC, with the operating capacity applicable to the shallow sea conditions (about 20 m). The 200 kW TEC was designed and manufactured by KIOST and its caisson-type substructure was designed, fabricated, and deployed by Hyundai Engineering and Construction in 2016. The performance of PMSG and main drive train has been evaluated using a portable dynamo test facility, and the internal communication system and the active rudder device for automatic and passive yaw control has also been tested in indoor and underwater environments in 2017-2018. The installation of TEC was postponed due to the weather condition and it will be installed in the Uldolmok test site for open sea test in the early 2019. For the commercialization of the ocean thermal energy converters (OTECs), KRISO is in charge of developing a 1 MW OTEC demonstration plant. The plan is to complete the installation on a barge and perform the short-term operation in the eastern coast of Korea by 2019, followed by transferring and construction as on-land type to conduct long-term operation in South Tarawa, Kiribati, in 2020. The Seventh International OTEC Symposium will be held in Busan, Korea, in 2019. There is no specific legislation for Marine Spatial Planning (MSP) alone, but legal base for offshore energy power production is governed and implemented by different national and domestic authorities. Ministry of Ocean and Fisheries (MOF) holds Public Waters Management Act & Reclamation Act (Act No. 11690, 2013), which provides a framework and general law governing management of public waters during structure installation or usage. One may install a structure in accordance with either of the Acts, but depending on their governing laws, applicable management and requirements may differ. Pre-selected areas for ocean energy have not been defined yet, although there are legal considerations to be made in the process of site selection primarily by the Public Water Management & Reclamation Act and Coast Management Act. Construction of demonstrative offshore wind turbine of Jeju Island was carried out based on the Assessment above. There may be additional authorities involved depending on the size and purpose of marine space usage, such as the Minister of Agriculture & Forestry and the director of the regional construction office. The consenting process can be classified into 2 levels. The first consenting level is for public waters management and reclamation which lasts for approximately 20-30 years after its development. The other consenting level is necessary for offshore construction only, which is a shorter process that lasts 2-3 years. An Environmental Impact Assessment (EIA) is required before and after construction. According to the Environmental Impact Assessment Act, the targeted projects for EIA are electric power plan with 10,000kW of capacity, 100,000kW solar/wind power plant capacity, submarine mining site of 300,000m2, public water reclamation over 300,000m2 (over 30,000m2 in protected areas), etc. and projects of smaller scale are targeted to Prior Examination of Environmental Nature. An EIA may be performed either by the developer or by the registered assessment agent and shall report within 30 days after each assessment. The entity responsible for decision making on requirement of an EIA is the Ministry of Environment. As for the post-construction monitoring system, the agent for assessment shall report the record of performance to the agency for the assessment of environmental impacts of the preceding year to the Minister of Environment. This may continue for a minimum of 5 years after construction depending on the results. The results of the EIA are disclosed to the public via an EIA database system (www.eiass.go.kr). - Submarine Mineral Resources Development Act. - Marine Environment Management Act. Consultation is required from a number of stakeholders in advance. The mandatory consultees are the Ministry of Environment, the Management Agency of Public waters (including the MOF, Regional Maritime Affairs & Port Office, city mayor, county governor and urban district head), and the head of other related administrative agency depending on each consenting stage. These are as prescribed by Presidential Decree. The most critical consultation that the developer should consider is the residents’ agreement. As for the public sector, in the process of obtaining the Use Permit of Public Waters, as prescribed by the Presidential Decree, the developer should disclose the information to local residents during more than 20 days, and hold an explanatory meeting or a public hearing if more than 30 people require it. The signed agreement from the inhabitants in the area must be included in the documents for the Use Permit of Public Waters, thus the entire process may be deterred at this stage if the developer fails in reaching an agreement.